You’ve heard of the books and films about The Sisterhood of the Traveling Pants? Well, the Newmark J-School has the traveling mugs. 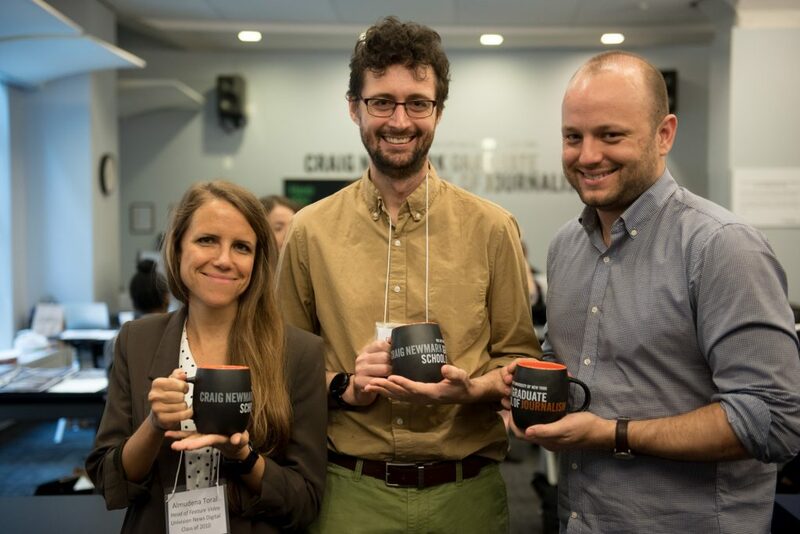 In a new series called Mugshots, we’re taking pictures of our alums holding the school’s colorful ceramic cups in the newsrooms where they work and showcasing the photos on our website and in social media posts. The image above shows no less than seven grads currently employed by The Wall Street Journal: Kathryn Lurie, ’08; Natalia Osipova, ’12; Katie Honan, ’10; Joseph Walker, ’09; Aisha Al-Muslim Harris, ’09; Rachael Levy, ’14; and Kimberly Chin, ’17. A video shot by our in-house production team at the annual Job & Internship Fair in October features recruiters speaking about why they want to hire our students. As we get ready to launch our 12th class of graduates into their journalism careers, the Newmark J-School is proud of how far our alums have come. Take Melissa Noel, ‘12, who’ll be representing you as alumni speaker at the Class of 2018 commencement on December 14. 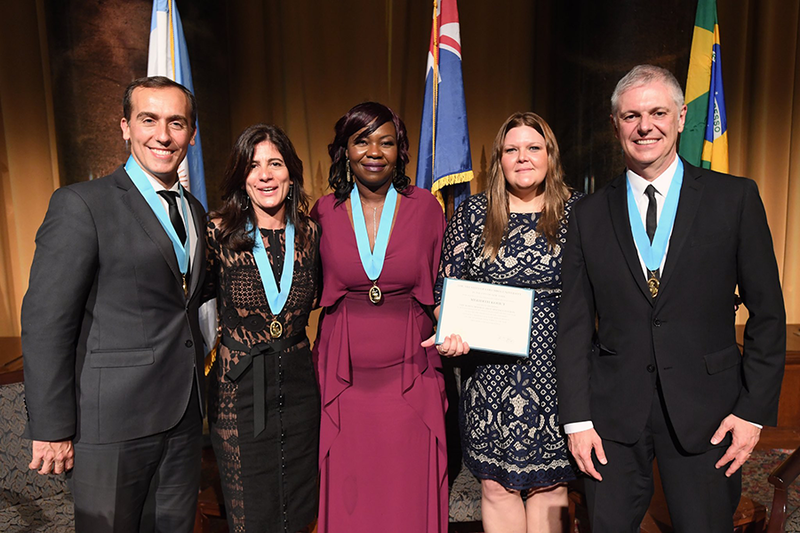 She has distinguished herself as an award-winning journalist and television host who has blazed her own trail covering underreported stories from the Caribbean. In this Fall 2018 issue of the Alumni Newsletter, you can read about the many other professional accomplishments and personal milestones your Newmark J-School peers have racked up in the past few months. I’d like to remind you that the next January Academy enrichment series will run from Jan. 7-24, 2019 with a lineup of more than 30 classes that are open to alums at reduced rates. You can start registering on Monday, Dec. 3. Look for the special alumni discount code in your email on Sunday. As always, we want to share what you’ve been up to, so please keep in touch. If you’re interested in teaming up with fellow alumni at your workplace to participate in our Mugshots series, please let me know and I’ll arrange to have you photographed with our mugs. We’ll even buy you coffee to fill them. The Craig Newmark Graduate School of Journalism at CUNY will honor a graduate with a $5,000 Stephen B. Shepard Prize for Investigative Reporting, funded by The Tow Foundation. *Alums who graduated from any of our J-School programs from 2007 to 2017 are eligible to nominate themselves or a classmate for this prize, provided the work was published in any medium in 2018. Deadline is Dec. 20, 2018. The Newmark J-School Alumni Board Wants You! 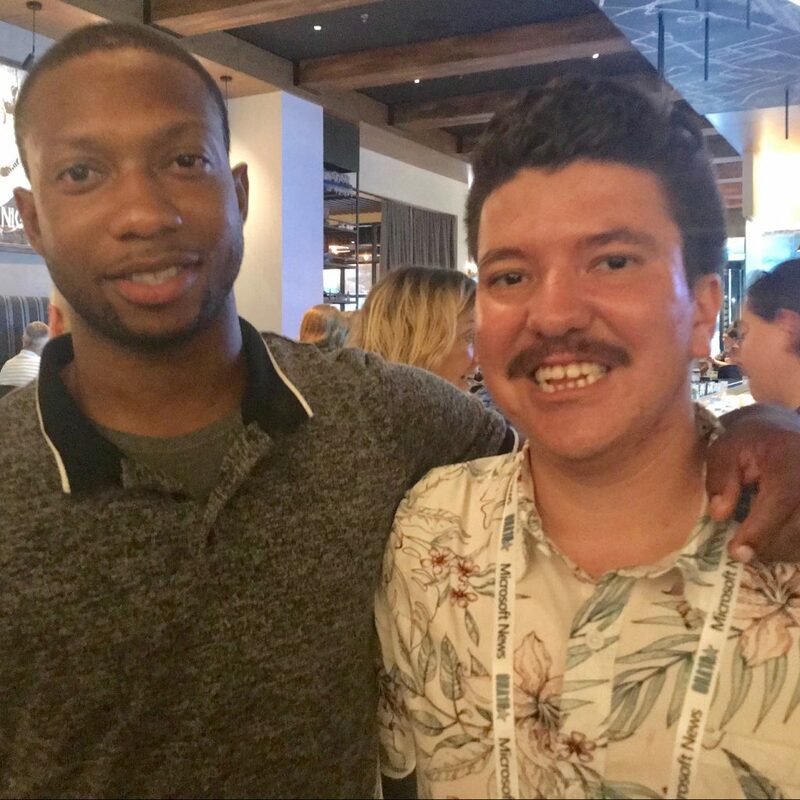 Eduardo Acquarone, EJ ’15, started a PhD program in Communication Sciences at the ISCTE-IUL in Lisbon, Portugal, where he’ll investigate the effects of immersive journalism. Alissa Ambrose, ’11, was promoted in September from senior photo editor to deputy director of multimedia and creative at STAT. Jessica Bal, ’15, started working with Susan Meiselas, a documentary photographer with Magnum Photos, managing her digital archive of 40+ years’ work. 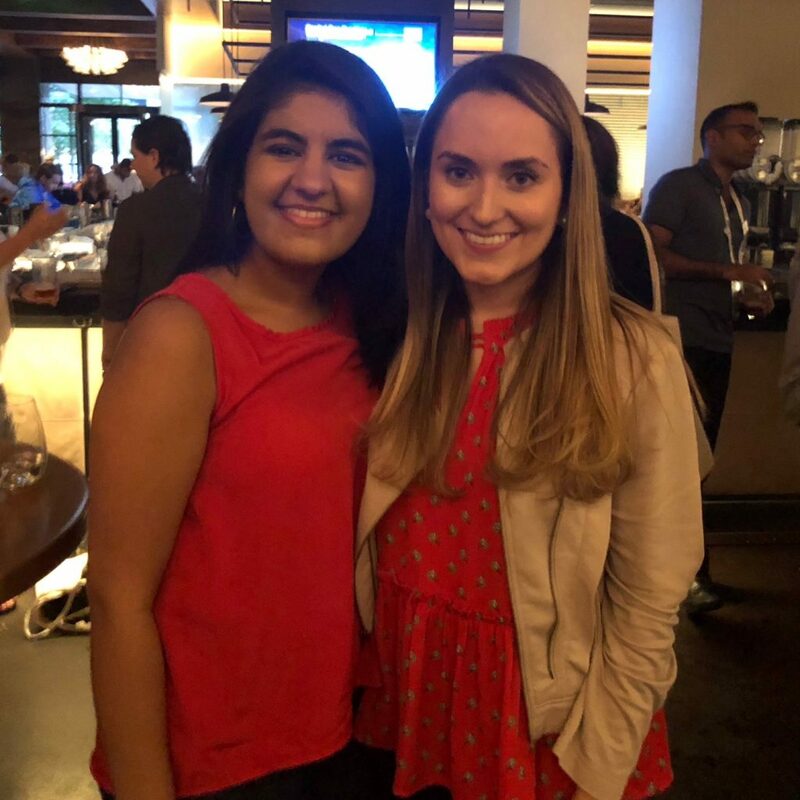 After interning at Tech Insider/Business Insider for six months, Prachi Bhardwaj, ’17, joined City and State New York as its first technology reporter. Rebecca Bratek, ’14, was hired as a senior editor at Factal, a new journalism-tech startup that verifies and digests breaking news for companies. Kathryn Casteel, ’16, joined Southern Poverty Law Center as an investigative reporter. Megan Cerullo, ’16, is leaving the New York Daily News to work at CBS MoneyWatch, where she’ll be a writer and video editor. After more than a decade as a multiplatform journalist, Kim Choe, EJ ’15, moved into product management at Newshub, one of New Zealand’s largest news outlets. Malik Edwards, ’17, started a job as a videographer at his alma mater Morgan State University. Kellie Ell, ’17, is working as a finance reporter covering the business of fashion at Women’s Wear Daily in New York City. After leaving INSIDER, Joanna Fantozzi, ’12, joined Nation’s Restaurant News and Restaurant Hospitality as an assistant editor. In October, Pamela Granda, ’14, left the Fox Business Network to join Yahoo Finance as an associate producer. Anthony Kane, ’15, was hired as a video producer at Oath’s Yahoo News. After more than four years at Business Insider, Kevin Loria, ’12, is now a health reporter for Consumer Reports. Doha Madani, ’16, left HuffPost to work as a breaking news reporter for NBC News in New York City. After overseeing storytelling for The New York Times’ Instagram page for 3.5 years, Kerri MacDonald, ’10, moved to Instagram, where she is working as a design researcher and producer. Colum Murphy, EJ ’18, moved to Shanghai where he is working as managing editor at TechNode, a publication focused on telling China’s tech story to the world. Sophia Rosenbaum, ’13, was hired as a news editor at the Associated Press, where she’ll cover all states from Ohio up to Maine. She was previously a senior news editor at TIME. In September Geneva Sands, ’09, joined CNN’s Washington bureau as its newest justice producer. Danni Santana, ’15, was hired by Skift, where he’ll cover the restaurant business. He was previously an associate editor at Digital Insurance. Roxanne Scott, ’14, is now a reporter at WABE News, the NPR station in Atlanta. Walter Smith-Randolph, ’10, joined LOCAL 12, WKRC-TV in Cincinnati as a reporter, where he’ll be working on stories for the station’s 11 p.m. newscasts and investigative unit. 2017 alumnae Nour Saudi and Joy Notoma launched The Shunned Project, a website that documents the stories of former Jehovah’s Witnesses who have been shunned by the organization. Derek Scancarelli, ’15, is contributing to Forbes and has interviewed celebrities including Yoko Ono, Sting, and Alice Cooper. 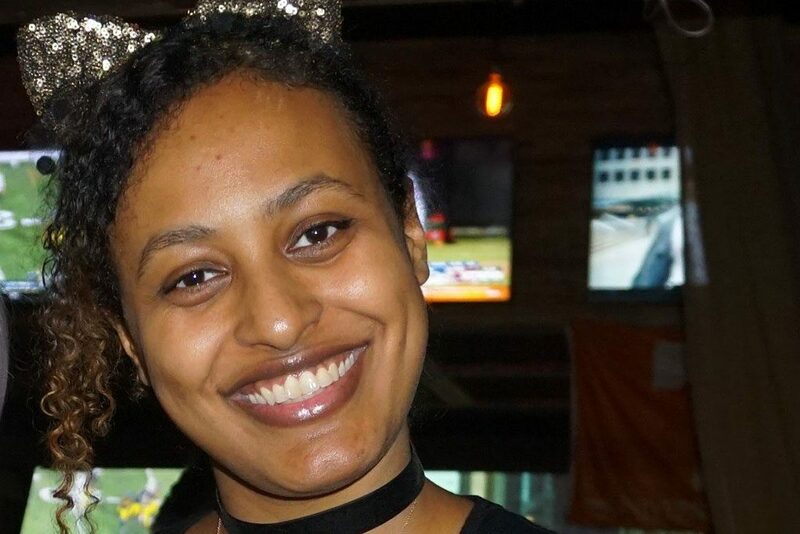 Roxanne L. Scott, ’14, was hired as a reporter at WABE News, the NPR station in Atlanta. Formerly a public defender in Queens, Margaret Teich, ’10, is now a criminal defense attorney in Asheville, North Carolina. Taylor Tepper, ’12, was hired as a senior writer at Wirecutter. After working as a freelance associate producer for Al Jazeera English’s web show “The Stream,” Lisa Thomson, ’16, was promoted to a staff position as assistant producer. Teresa Tomassoni, ’10, was hired by the U.S. State Department to train journalists in Ethiopia and Malawi during December on how to cover gender-based violence and human trafficking. Matt Townsend, ’08, expanded his reporting duties at Bloomberg News to cover the intersection of corporate America and the White House. When she participates in these events as a speaker, she says she likes to demonstrate by her words and actions that good journalists do their research, prepare for their interviews with sources, are fair, and seek to find the truth. She most enjoys staying updated on the forefront of technology advances. “I’m very fortunate to interview sources and attend events where the topic is, for the most part, the future, and not the past,” Cruz says. 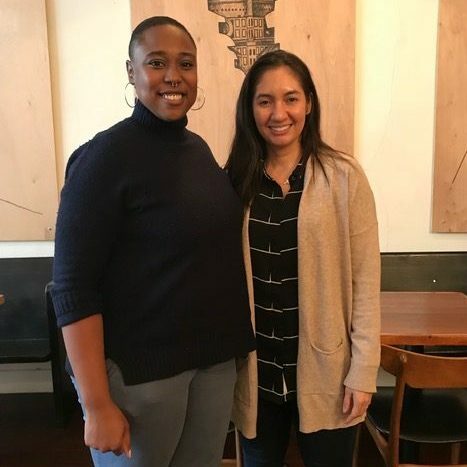 Left to right: Adi Barreto, senior account executive at Textio, and Claudia Cruz, ’08, at the “Embracing Intersectionality in Tech” panel in Oakland, CA. Jessica Bal, ’15, was selected to attend the 2018 Double Exposure Film Festival in October as a Fledgling Fund Fellow, an opportunity for journalists focused on reproductive rights reporting. 2016 alums Joaquin Cotler and Michael O’Brien are wrapping up a radio documentary about the tech industry’s incursion into Puerto Rico’s post-Maria recovery for a new and unnamed podcast that will be produced by Futuro Media. 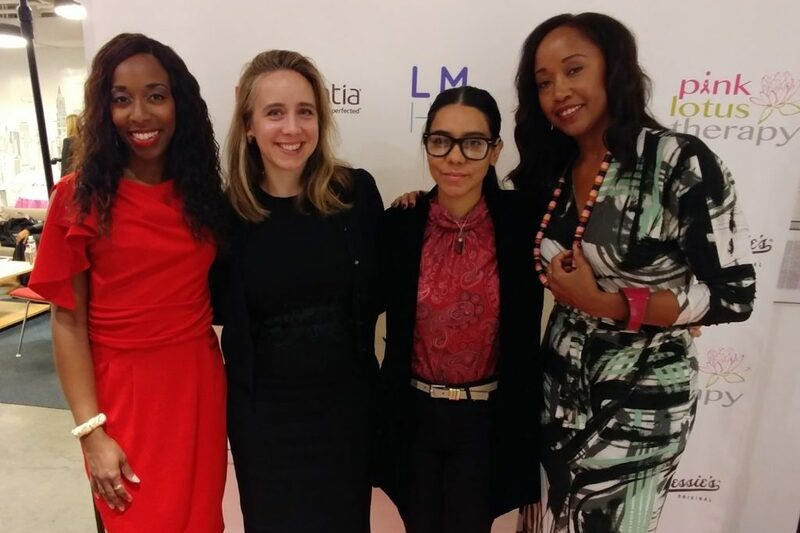 Kizzy Cox, ’12, (far left in photo above) moderated the Empowering Women in Media panel organized by the non-profit Positive Women United on October 19. 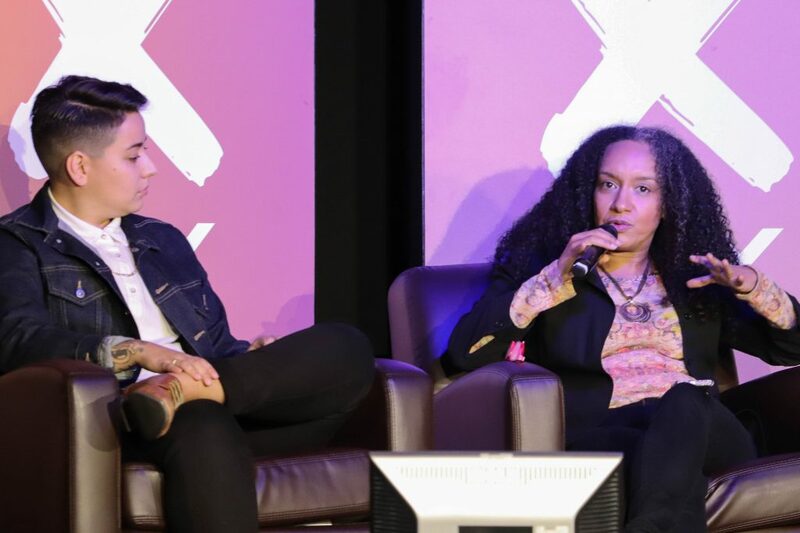 The diverse group of panelists included (left to right) Simone Swink, executive broadcast producer of Good Morning America; Angela Ellis, former content producer and programming executive for Good Morning America; and Klenimber Torres, filmmaker and CEO of Cosmos Entertainment. Dale W. Eisinger, ’10, received a grant from the Institute for Policy Studies’ Economic Hardship Reporting Project for a story he is working on about the application of forensic anthropology to the migrant crisis on the U.S.-Mexico border. Lori Freshwater, ’16, published her capstone, What Happened at Camp Lejeune, in Pacific Standard. Rebecca Harris, ’14, is featured in 2019’s Forbes 30 Under 30 Media list for her project, Purple. Patrick Hickey Jr., ’11, was elected chairman of the CUNY Journalism Discipline Council, where CUNY undergraduate journalism faculty and directors share ideas with representatives from our grad school. City and State New York added Joe Hirsch, ’07, editor of The Hunts Point Express and Mott Haven Herald, to The 2018 Bronx Power 50, its annual list of the most influential people in the city’s northernmost borough. 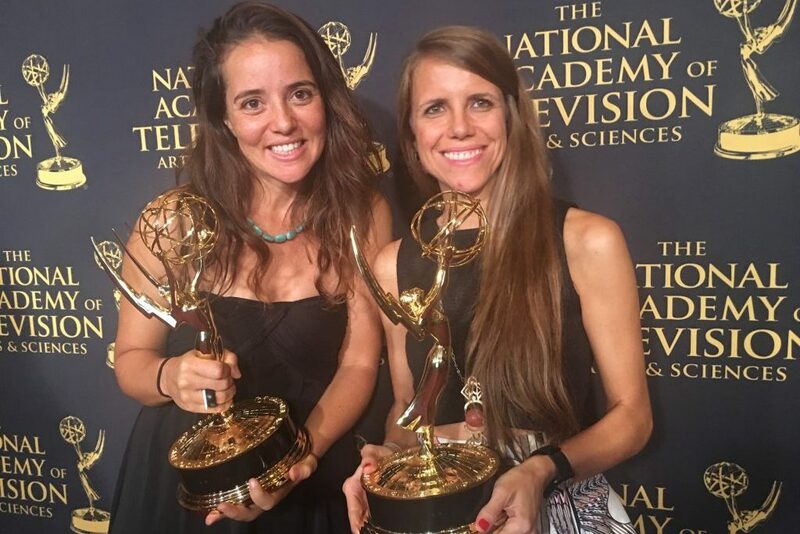 Class of 2010 classmates Mariana Keller and Almudena Toral display their news and documentary Emmy awards. Mariana Keller, ’10, and her NBC News Digital team won an Emmy award for Outstanding Feature Story in a Newsmagazine for Battling Dementia: A Mother and Son’s Incredible Journey. In addition to teaching in the English Department at Borough of Manhattan Community College and at Lehman College, Dmitry Kiper, ’07, is a painter. He is the 2018 fall resident at the Con Artist Gallery & Collective on the Lower East Side, where his paintings have been exhibited seven times. Natalie Madeira, EJ ’18, was named 2018’s Advocate of the Year, the highest honor bestowed by U.S. Department of Commerce for minority business. Barbara Marcolini, ’17, and her New York Times team won an Emmy award for their Las Vegas coverage in the “New Approaches: Current News” category. 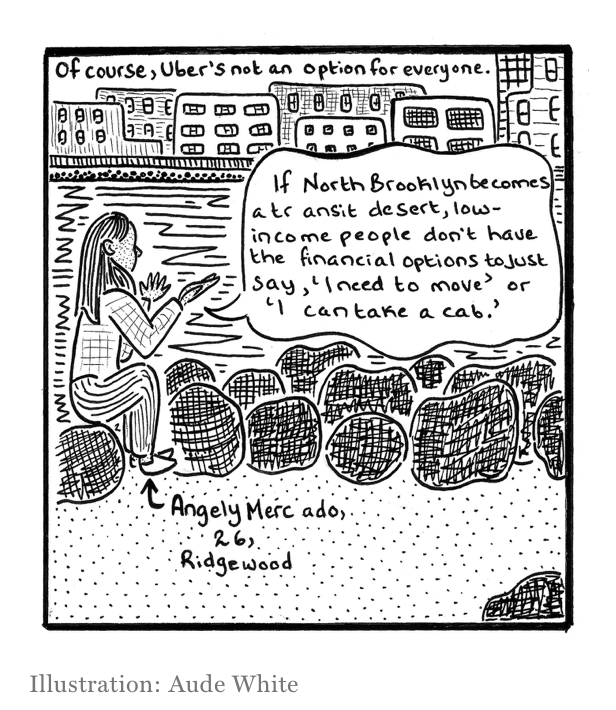 Transit writer Angely Mercado, ’16, was interviewed by Emma Whitford from New York Magazine’s Intelligencer column about the L train shutdown, where her perspective was captured in a cartoon form. “Three Rivers Rising” by PublicSource‘s environment and health reporter, Oliver Morrison’s, ’14, was named a finalist in the “Explanatory Reporting” category by the Online News Association. Jeanne Pinder, EJ ’10, is a TED resident this fall. Ramnath Subbaranan, EJ’14, co-wrote The Aadhaar Effect, a journalistic account of India’s digital identity project. Pauliina Siniauer, ’17, is a finalist for The Food Sustainability Media Award 2018. You can vote for her story, “A trashcan lady is now feeding the neighborhood,” in the “Written Journalism and Unpublished” and “Best of the Web” categories. Caroline Shin, ’16, expanded her project, Cooking with Granny™, into a video and event series, where diverse immigrant grandmothers cook family recipes and tell cultural stories. 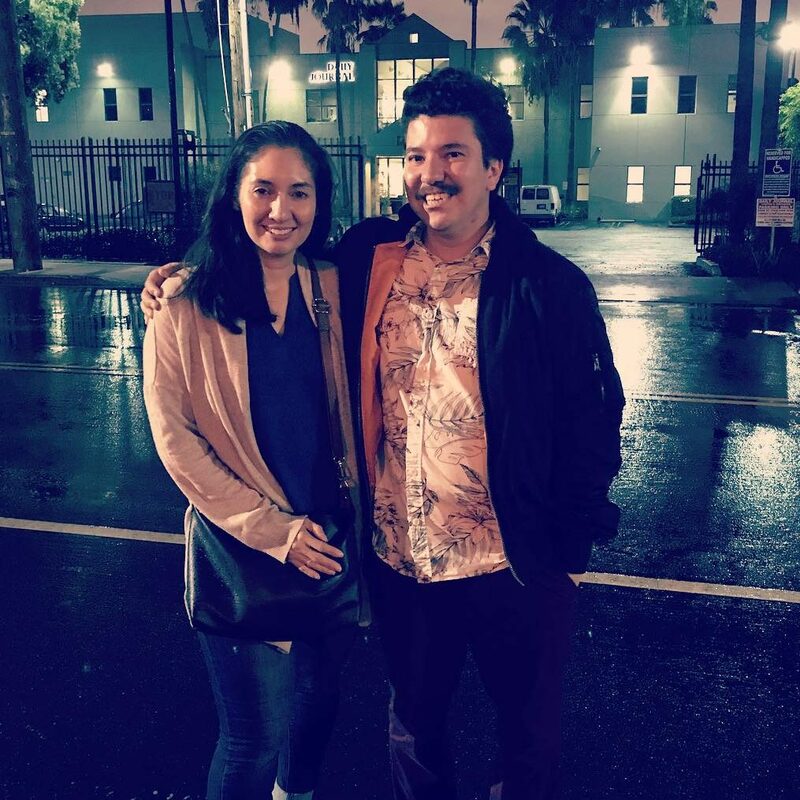 Almudena Toral, ’10, head of feature video at Univision News Digital, won an Emmy in the “Outstanding Feature Story in Spanish” category for Fear in Trump Territory – This is the U.S. City with the Highest Proportion of Undocumented Immigrants. Matt Townsend, ’08, was recognized by 2018’s Excellence in Financial Journalism Awards. Linda Villarosa, ’13, New York Times Magazine contributing writer and City College of New York assistant professor of journalism, is working on her book, Under the Skin: Race, Inequality, and Health of a Nation, which will be published by Doubleday in 2020. She was also awarded a Poynter Fellowship in Journalism. María Villaseñor, ’14, produced a piece for Retro Report about the future of water. Nine Newmark J-School pieces were nominated for the 2018’s EPPY Awards. NYCity News Service won its third straight Editor & Publisher EPPY Award for the best site of its kind in the country. 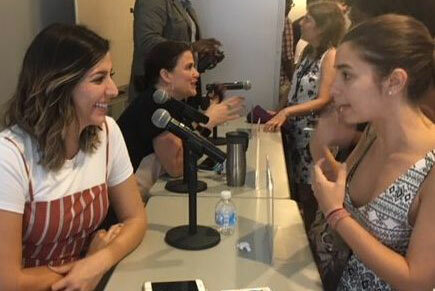 After participating on Career Services’ NPR/Public Radio panel in September, Constanza Gallardo, ’17, (left) assistant producer of Planet Money’s “The Indicator,” spoke to Isadora Varejao, Social Journalism ’19. 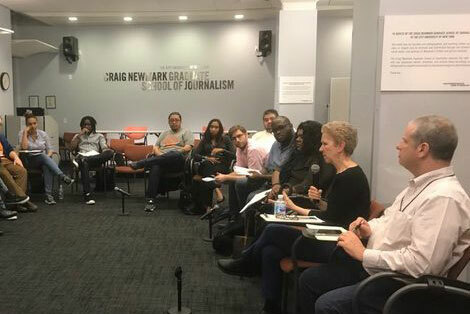 Alumni met with Dean Sarah Bartlett and Associate Dean Andrew Mendelson in September to discuss the future of the Craig Newmark Graduate School of Journalism at CUNY. 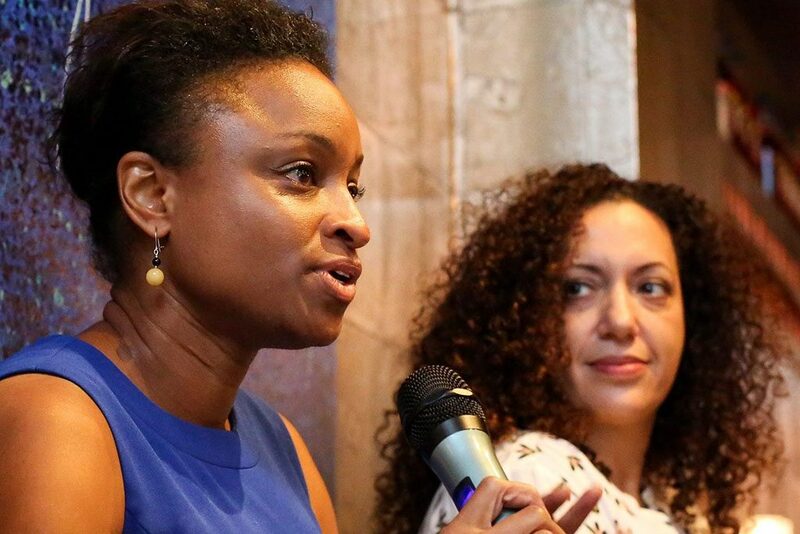 Angela Hill, ’07, (left) was part of a panel, “Tools and Skills for Today’s Journalists,” sponsored by the Georgetown University Society of Professional Journalists’ chapter and Ida B. Wells Society in Washington, D.C.
Mariana Keller, ’10, was a fellow in the East-West Center’s 2018 China-U.S. 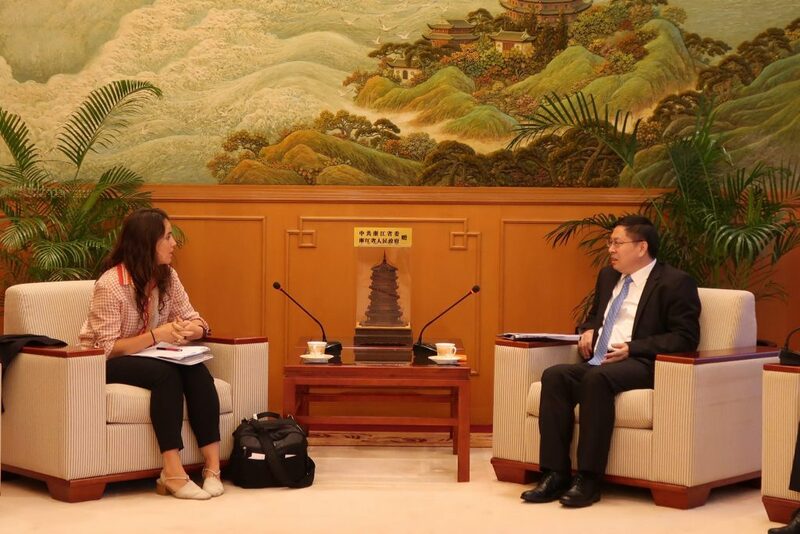 Journalists Exchange program, where she interviewed Song Ru’an, deputy commissioner of the People’s Republic of China Ministry of Foreign Affairs in Hong Kong. 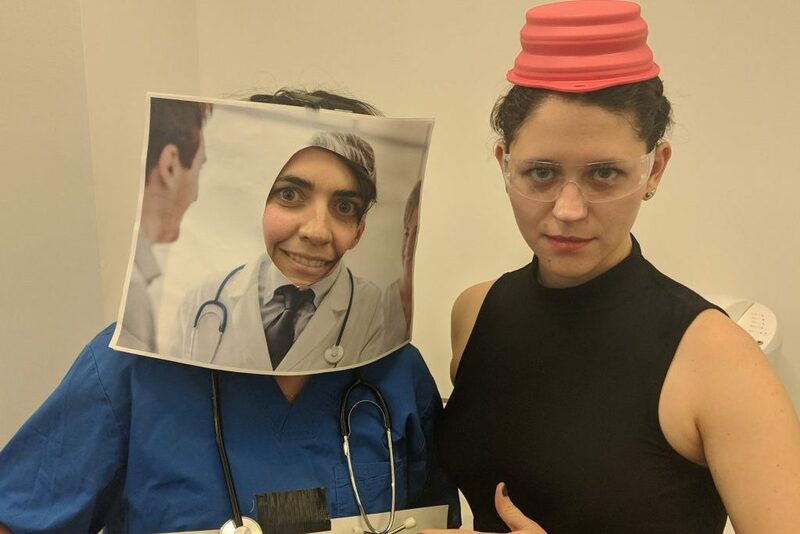 Alissa Ambrose, ’11, deputy director, multimedia and creative at STAT, won the “Most Creative Costume” award at the Boston Globe Halloween party for her “bad stock photo of a doctor” costume. Class of 2016 alums Nick Perez and Omari Bravado reunited at the conference and explored the city of Austin on their free time. 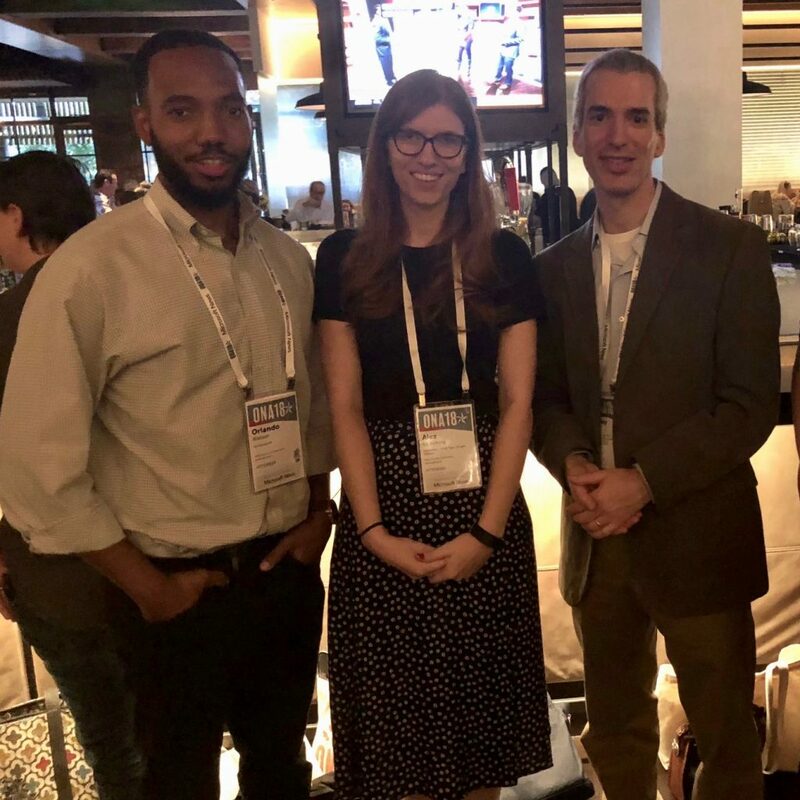 Orlando Watson, EJ ’16, and Alex Eggerking, EJ ’16, chatted with Jeremy Caplan, education director for the Tow-Knight Center for Entrepreneurial Journalism. 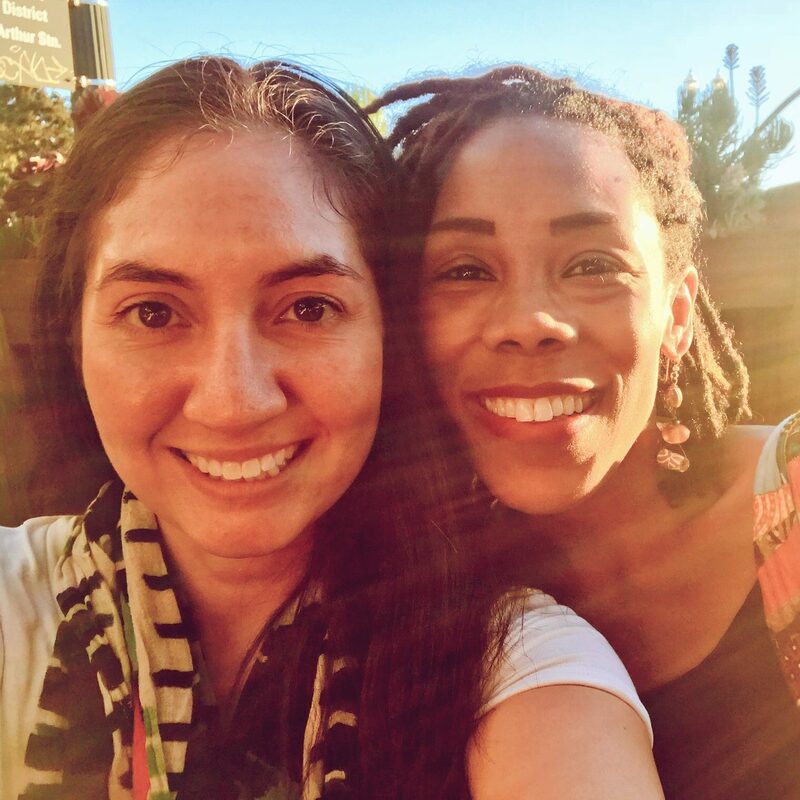 Hanaa Tameez and Maritza Villela, Spanish-language Journalism Program 2017 alumnae, caught up about their new lives working in Texas. 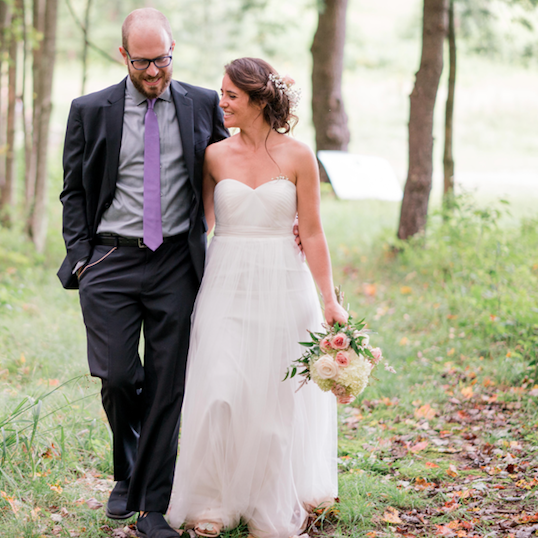 Mariana Keller, ’10, married John Henninger on August 19 in Ellicottville, NY. 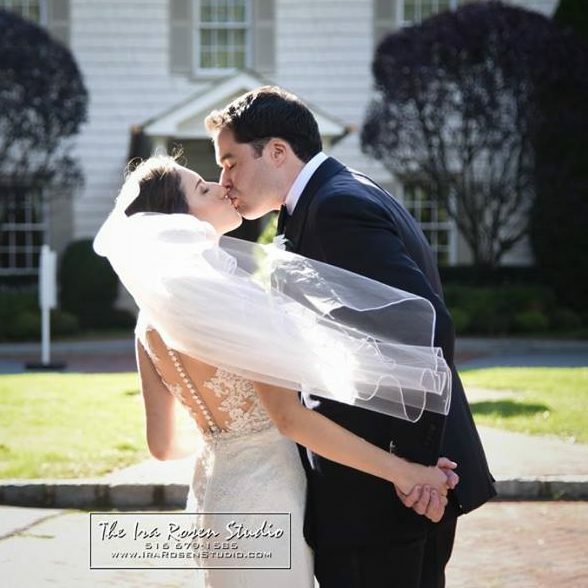 Melissa Bykofsky, ’12, married Bradley Rothman on October 21 in Roslyn Heights, NY. 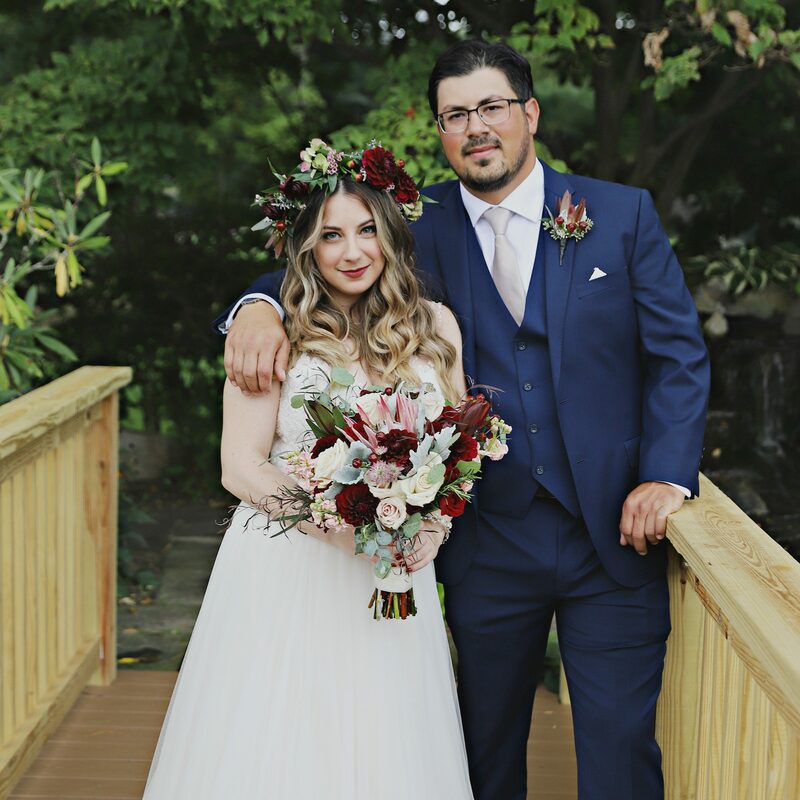 Nicole Turso, ’09, married Michael Nola at Stonebridge Country Club in Smithtown, Long Island on October 7. 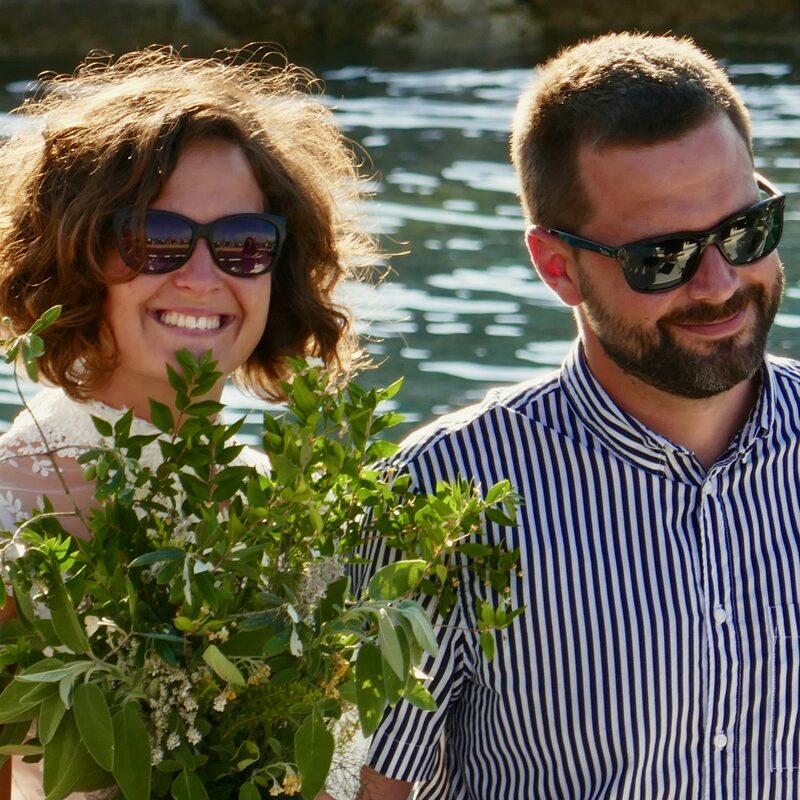 Joe Orovic, ’07, married Tina Rokov on her grandfather’s old wooden boat, just off of the Croatian island of Iž, on June 30. Brigid Bergin,’07, and husband Bob introduce Patricia Jane Bergin-Hardt, born June 5. 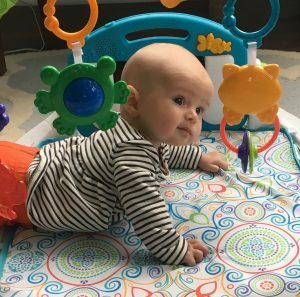 Amy Eley, ’13, and husband Jared Moran welcomed their daughter, Olive, in September. 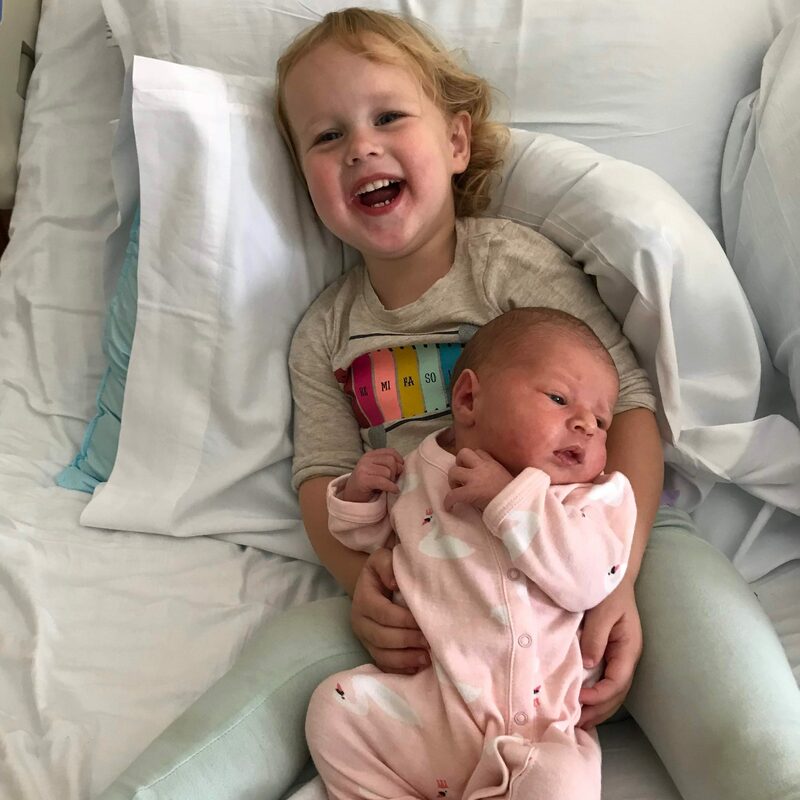 Harper is a very happy big sister. 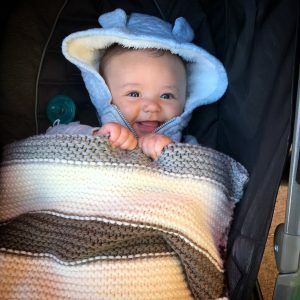 2012 alums Anika Anand and Ken Christensen welcomed son Aiden Anand Christensen on June 27. 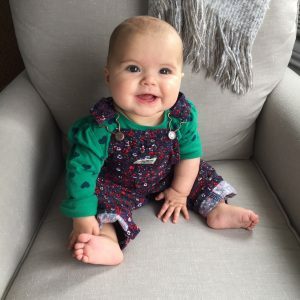 Alissa Ambrose, ’11, gave birth to her second daughter, Juniper, on May 10. 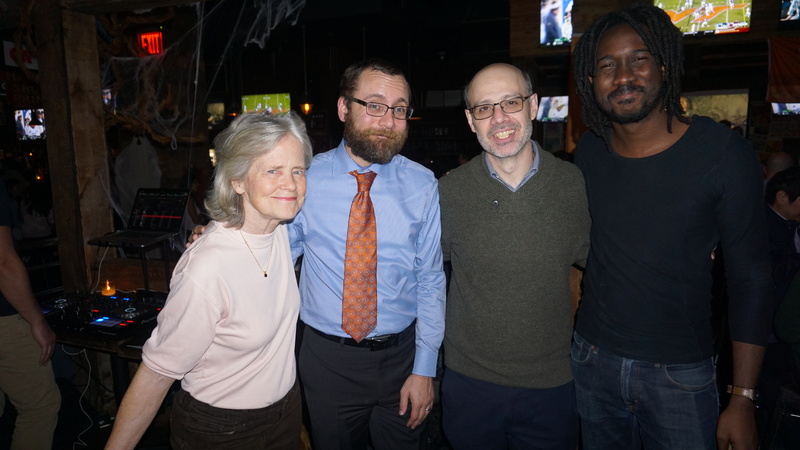 In October, Jere Hester, director of Reporting and Writing, News Products and Projects, and the NYCity News Service, left the Newmark J-School to become the founding editor of The City, a new, nonprofit news outlet that will produce in-depth coverage of New York City. Jeanette Tavarez joined the admissions team as associate director of admissions. She previously worked in the admissions office at John Jay College of Criminal Justice. Spanish-language Program Director Graciela Mochkofsky received a Maria Moors Cabot Prize on October 10. Where in the world is Admissions Director Colleen Leigh? 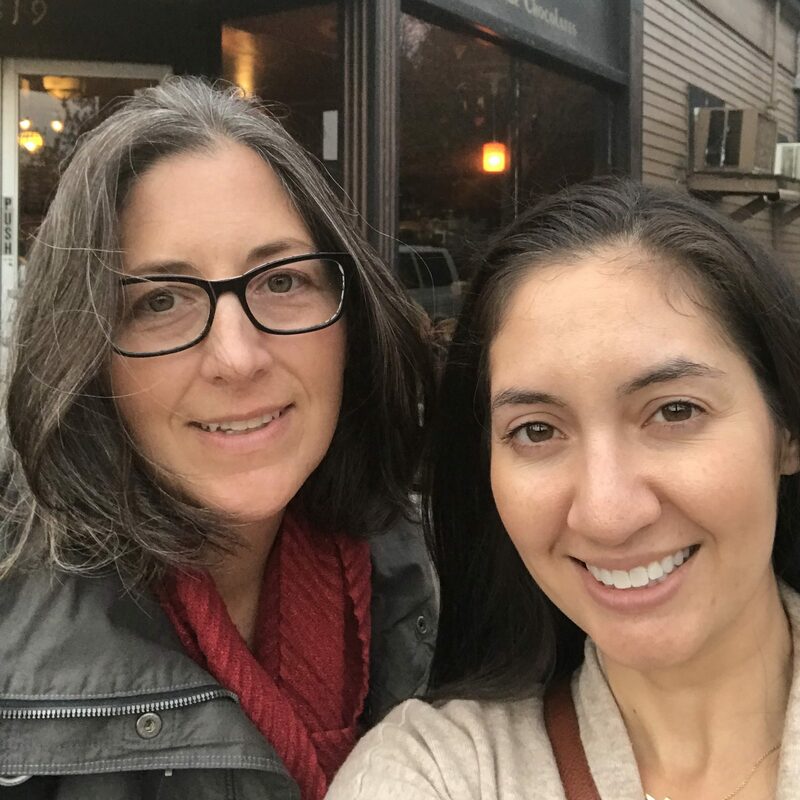 Colleen met up with Allegra Abramo, ’15, at a Seattle coffee shop called Chocolati. 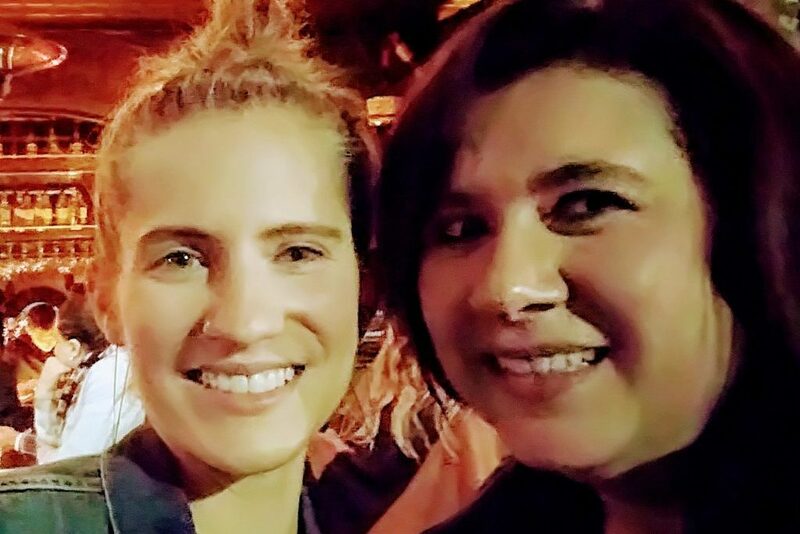 Colleen caught up with Deonna Anderson, ’16, at the Commissary Kitchen in Seattle. 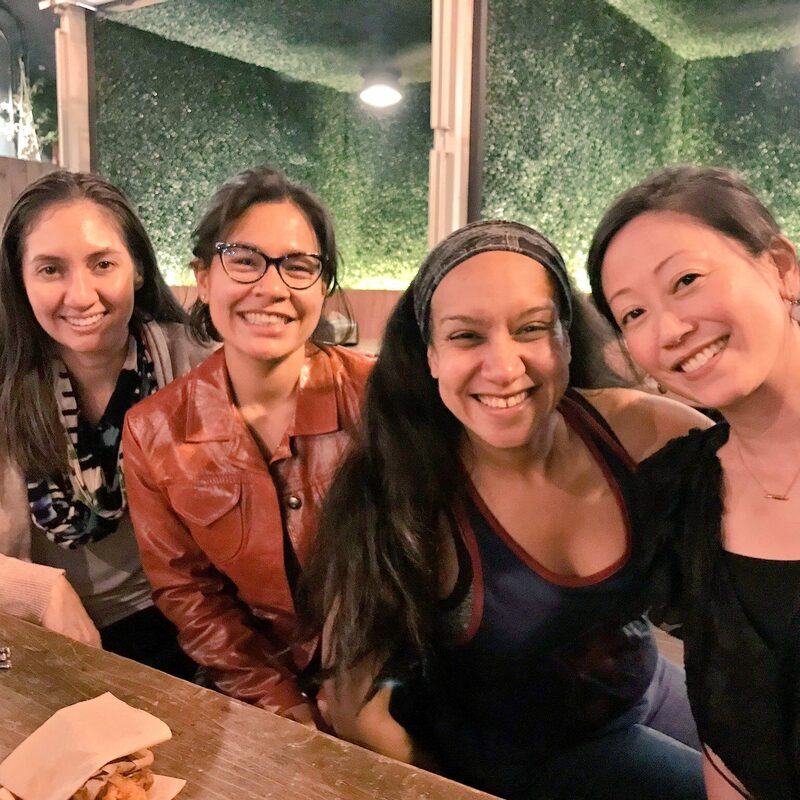 Maya Pope-Chappell, ’09, and Colleen took a selfie at Arthur Mac’s Tap and Snack in Oakland, Calif.
Colleen met (left to right) Tiffany Camhi, ’13; Claudia Cruz, ’08, and Tina Pamintuan, former Newmark J-School audio program director, at Arthur Mac’s Tap and Snack in Oakland, Calif.
She also met Nick Perez, ’16, in Los Angeles. 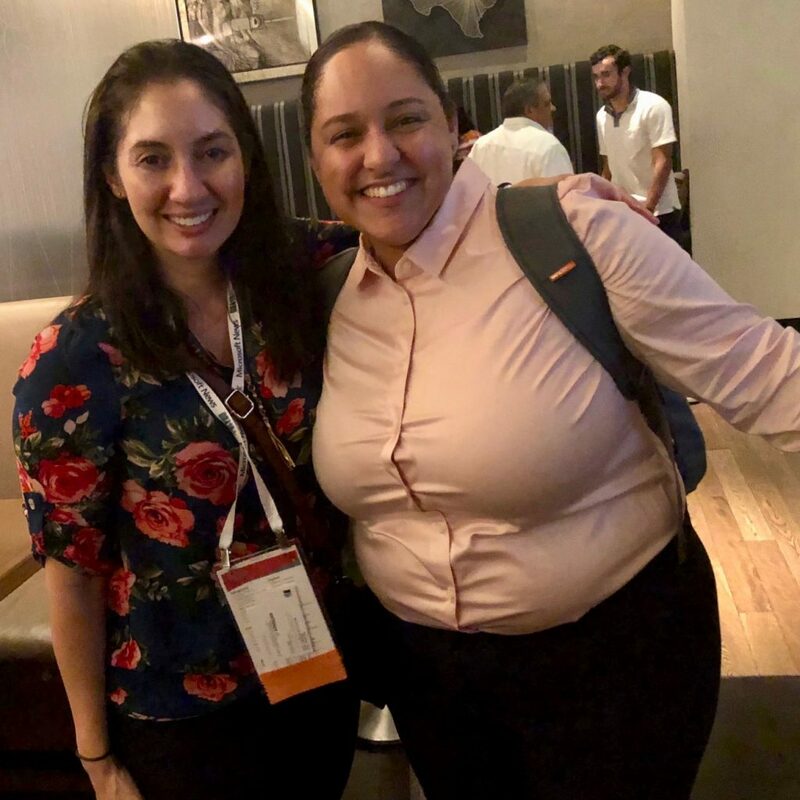 Jeanette Tavarez, associate director of admissions, had an exciting first week on the job traveling to Austin, Texas with Colleen for ONA. Be a Next Gen Donor! 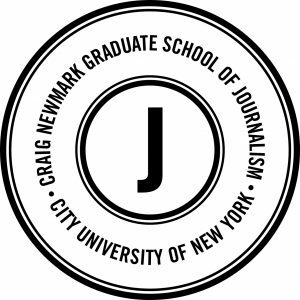 Support scholarships at the Craig Newmark Graduate School of Journalism at CUNY. J+ is collaborating with alumni on creating courses focused on their needs. As of now, an “Intro to Premiere” class is being developed for December. We encourage alumni interested in promoting their work to send links and photos to Social Media Marketing Manager Ellen Lai, who presides over the Newmark J-School's social media accounts.